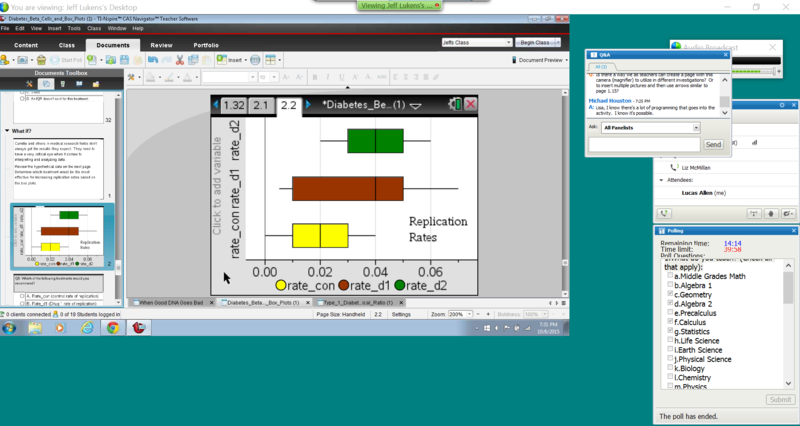 My wife was good enough to pick up extra bed time duty with our kids tonight so I could take in the latest Texas Instruments T3 webinar, Behind Health with TI Technology. As is always the case with these webinars, the content was excellent, incorporating interdisciplinary content from science and statistics. This particular webinar focused on TI’s Stem Behind Health, which I talked about more in a previous post. The content in their latest module focuses on breast cancer. I was quite taken with how they were able to both address mathematical and scientific issues while at the same time addressing a very serious health issue in a thought provoking way. At the webinar, it was announced this newest activity goes live on the Stem Behind Health on Monday, October 12. Attending the webinar got me thinking that there are probably readers of this blog who aren’t aware of the T3 webinars, or have never attended one. I know how busy teachers are, but if you are looking for good ways to engage your students in a math or science context, give me the next couple of minutes to make the pitch for attending one this school year. T3 Webinars are taught by engaging instructors, who are either experienced educators or experts in a specific field. In the case of the tonight’s webinar, the instructors were Liz McMillan, Director of Education and Outreach at Sanford Research, and Jeff Lukens, a T3 National Instructor with 34 years of experience in the classroom and 2002 South Dakota teacher of the year. The type of lesson that webinar instructors put together always involves a Texas Instruments technology such as the TI-Nspire or TI-84, but I have found that these webinars are more focused on engaging students on a particular set of concepts than they are focused on the technology itself. That said, the instructors do a good job of implementing the TI technology for teachers wherever they are, be it as a beginner or more advanced user. I have attended the T3 International Conference on several occasions (which I would recommend to anyone as it’s fantastic), and these webinars would fit right in if presented as sessions at the T3 International Conference. The webinars are presented live, and you have the opportunity to interact by asking questions via chat. The webinar I attended tonight had 101 participants, a reasonably small enough number that I believe just about everyone who asked a question got it addressed. The list of upcoming webinars is posted on the TI website. If you are unable to attend live, you can always catch the recording of a webinar on demand when it is posted in the large webinar archive shortly after the live session. In addition to the new ideas you’ll leave a T3 webinar with, you’ll also leave with some tangible benefits. First, Texas Instruments provides those that attend a live session with a Certificate of Attendance. Depending on your state’s rules, you may be able to use that as continuing education hours towards renewing your teacher’s certificate. 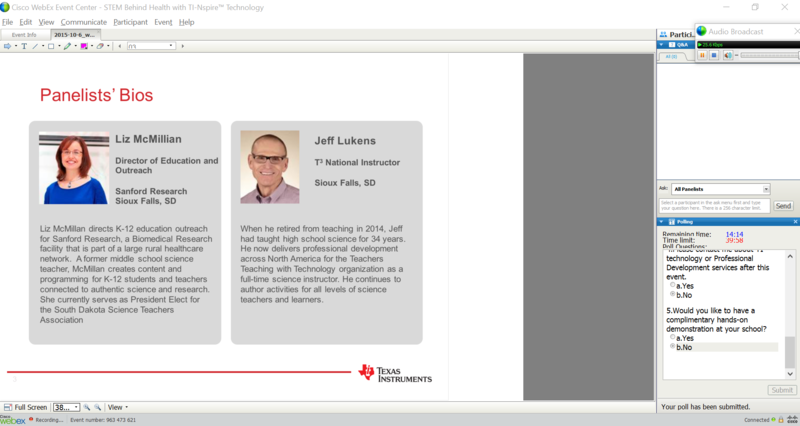 Additionally, Texas Instruments creates very polished lesson plans and other materials necessary to accompany the lessons suggested in their webinars such as handouts for students and document files for the TI-Nspire. Considering the cost (free), it’s especially hard to overlook this great source of professional development in a time of shrinking school budgets and busy schedules.